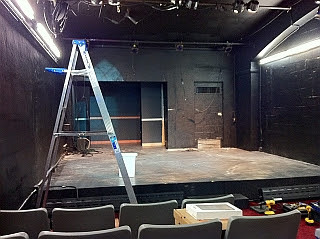 Naked Stage, naked. Via Facebook. We hope you're enjoying the new format of The South Florida Theatre Scene. We know that we are. It's really fun using the drop-down menu to see it in a different layout. And the larger reading pan makes it easier to read. We're no longer forced to scroll down a couple of feet of column. Did you find the fly-out tool bar on the right hand side? There's still time to take advantage of the Theatre League's A Taste of Summer Theatre. All you need do is see plays at three qualifying theaters, and you must have done that by now, right? Sure you have. The big news from Florida Theater On Stage is that Mayor Giminez 's proposed budget for Miami-Dade County does not cut funding for the arts. However, the budget still needs to be approved by the county commission. BroadwayWorld has launched a series called Featured Regional Theater of the Week, and the week the honoree is South Florida's own Actors' Playhouse at the Miracle Theater! Personally, we think the photographer could have laid off the wide-angle lens, but it's a nice feather in the cap for Barbara Stein and David Arisco. It's interesting that one of the previously featured theatres. The Morris Center has been restored to its 1921 glory, but now sports a marquee that includes LED panels. The City of Coral Gables rejected the Playhouse's plan to install a similar system during their marquee renovation a few years back because "it wouldn't be historically accurate." Funny how only the Gables' historic board feels that way. The Miami Herald fills us in on UM Theatre Department's upcoming festival celebrating the work of Cuban playwright Virgilio Piñera. A prolific playwright in South America during the 1940's and 50's, his work is largely unknown to US audiences. Stylistically adventurous, a modernist ground-breaker whose controversial Electra Garrigó preceded Eugene Ionesco’s absurdist The Bald Soprano by two years, the prolific Piñera was one of the world’s great writers, a novelist, poet, essayist and short story writer as well as a dramatist. Florida Theater On Stage fills us in on the re-emergence of Ground Up and Rising, a small theater company that had dropped off the map they had been wandering around on for the last few years. Now they're back, and they have a plan. Which probably isn't as ominous as we made that sound. They're not Cylons, fer gosh sakes. At least, we don't think they are. The Miami Herald reports that Valerie Harper is returning with Looped, the biographical play about Tallulah Bankhead which went from West Palm Beach's Cuillo Center to Broadway back in 2009. It will play the Parker Playhouse for a week starting February 26, 2013. The Examiner takes a look at the African American Performing Arts Community Theatre, and tells us a little bit about their upcoming production of The Dutchman, opening September 5 at the African Heritage Cultural Arts Center Wendall Narcisse Performing Arts Theatre, which has just unseated The Nova Southeastern University Don Taft University Center Black Box Theatre for "Most Awkwardly Named Venue in South Florida." Butts In Seats expands on an earlier article that dealt with arts organizations and construction projects. But he goes on to explore how groups view other groups in the same region. Still it raises a lot of questions about how accurately cultural organizations, and I daresay businesses as a whole, assess the impact of developments on the economic conditions of their communities. I suspect the assumptions arts and cultural organizations make are little different from those other businesses make about the impact that will result upon the arrival of a big box retailer like WalMart, Best Buy or Home Depot. Of course, if you want to see a new play every week, you have to go to a different theater every week.